The witches in Macbeth may seem like otherworldly creatures. They often speak in weird little rhymes: “Fair is foul, and foul is fair!” (1.1.12) They talk in riddles: “Lesser than Macbeth but greater!” they say of Banquo (1.3.68). They look like a cross between men and women: “You should be women,” muses Banquo, “And yet your beards forbid me to interpret/ That you are so.” (1.3.48-49) They appear to be nothing more or less than a trio of scary genderfluid poets, wandering about while spouting verses on the desolate Scottish moors. But in fact, Shakespeare’s witches, like nearly all witches of Shakespeare’s time, have their roots in the kitchen more than in the study. In seventeenth-century England, accused witches were most frequently housewives, and often poor or middling ones. Such women commanded few esoteric bodies of knowledge. Their domain centered around the hearth: pots and pans, knives and spoons, foods and drinks, and the animals that lived in or around their houses. They owned few or no books—or perhaps only one, a recipe book full of the accumulated domestic wisdom of their lives: how to make cherry wine, or sweetmeats, or perfumes, or a poultice to cure an injured eye. 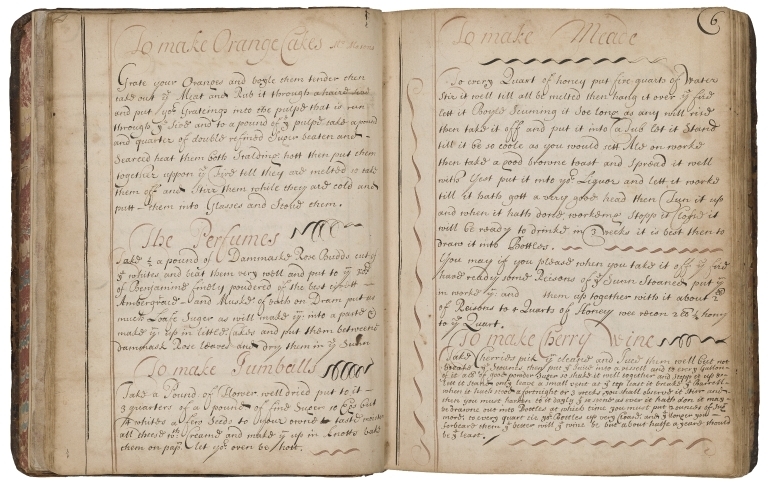 Looking inside those handwritten English recipe books (the Folger has the world’s largest collection of them) gives us a rare window into the lives of early modern women whose voices are otherwise lost. The book pictured here—whose recipes were copied down and signed by several women, all of whom lived in England during the late seventeenth and early eighteenth centuries—contains the sorts of recipes that the Renaissance English housewife needed to know in the course of keeping her family fed, clothed, and safe from harm. Few of the recipes are straightforward or easy, as you might expect of a world without microwaves, refrigerators, supermarkets, or even the odd Ziploc bag. What these cooks did have was time, as the recipe for mead (a drink somewhat like beer, but made with fermented honey instead of hops) at the top right of the page shows. After boiling honey and water together and adding “a good browne toast” spread with yeast, the cook leaves the mixture for three weeks and hopes for the best. What if it is spoiled after all that time has passed? Nothing to do but throw it out and start a new batch. The owners of these recipe collections had little room for error. They needed to know what they were doing in order to keep producing healthy and tasty food for their families, and quality medicines for their communities. Gathered around their cooking pot, the weird sisters know how to cook up a sensational meal. You don’t just find a fenny snake at your local butcher shop—you really have to hunt for it. But if the witches spend great effort toiling in their open air kitchen, the meal they create is a meal to kill rather than to nourish. And it’s a meal for the eyes, not the stomach. When they are finished, they serve Macbeth not soup but visions: the apparitions of eight kings, all of whom look like Banquo, whose son Macbeth has just tried to kill. It is like an episode of Iron Chef that results in the use of actual iron. Macbeth comes away from it determined to kill whomever he must in order to retain his power. Matthew Hopkins. The discovery of vvitches: in answer to severall queries, lately delivered to the judges of assize for the county of Norfolk. 1647. Folger Shakespeare Library. 144- 461q, frontispiece. The kind of knowledge that early modern women kept in their recipe books was also used against them by those who accused them of witchcraft. 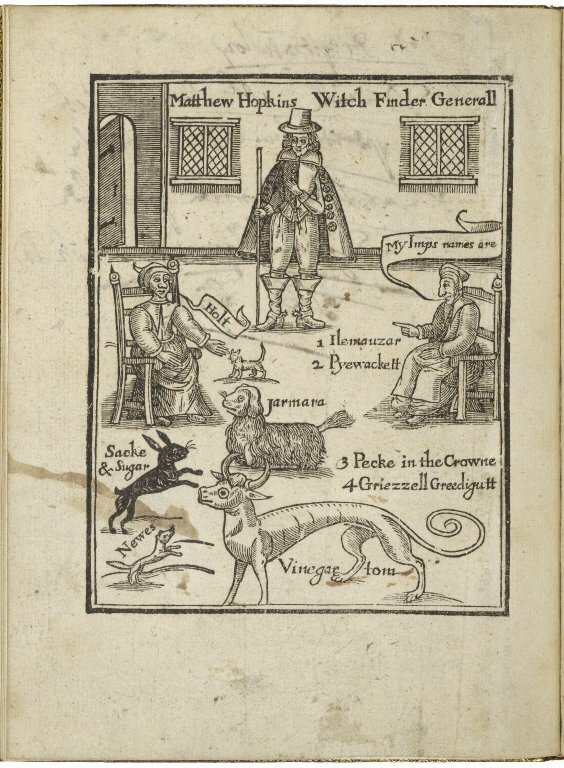 One of the most notorious witch hunters of his time, Matthew Hopkins, published a book in 1647 that opens with an illustration showing the kinds of familiars (animal helpers) that witches might call forth to help them with their wicked spells. The familiars have names that evoke the kitchen-wisdom of a housewife, such as “Vinegar Tom,” “Sacke [wine] & Sugar,” and “Pyewackett.” There was a fine line between having the skill to bake a cake or cut up an animal’s carcass to roast it, and using that skill to injure others. Court cases of the time abound with accusations of crimes such as wrecking milk pans or warping spindles. Putting dinner on the table today, in an age of mechanized kitchens, seems like a pretty straightforward process. In Shakespeare’s time, though, it carried echoes of darker knowledge and more fearsome ways of shaping the ordinary world. This blog post is based on a recent talk and pop-up exhibition produced in association with the Folger Institute, the AHRC-funded Folger Theatre production of William Davenant’s 17th-century adaptation of Shakespeare’s Macbeth, and the Mellon-funded initiative in collaborative research, Before ‘Farm to Table’: Early Modern Foodways and Cultures. David B. Goldstein is a critic, poet, food writer, and Associate Professor at York University in Toronto. His publications include Eating and Ethics in Shakespeare’s England (Cambridge University Press, 2013) and the poetry collection Lost Originals (BookThug, 2016). He is currently co-director of the Folger Shakespeare Library’s Mellon-funded research project Before ‘Farm to Table’: Early Modern Foodways and Cultures. How thick of me not to realize that the witch’s traditional grimoire, or spell book, likely began as the humble cook book!